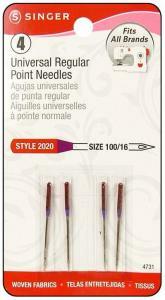 Regular Point (Style 2020) needles are used for all woven fabrics. 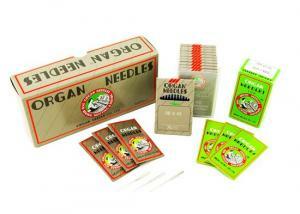 This needle will penetrate the fabric threads of woven fabrics. 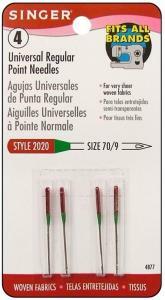 Chromium Regular Point (Style 2000) needles are recommended for sewing woven fabrics on all SINGER® and QUANTUM® embroidery machines. 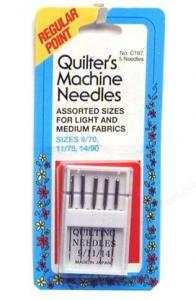 This stronger needle is longer lasting and will tolerate the high stitching speed of embroidery machines. Chromium Ball Point (Style 2001) needles are recommended for sewing knit fabrics on all SINGER® and QUANTUM® embroidery machines. 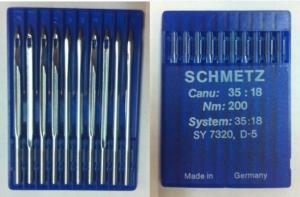 This stronger needle is longer lasting and will tolerate the high stitching speed of embroidery machines. 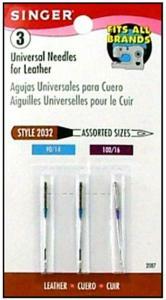 Denim or Jeans (Style 2026) needles are recommended for sewing denim, jeans, and canvas. 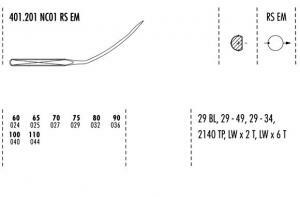 Twin Needle (Style 2025) is used for stitching two closely spaced parallel rows at a time - for decorative stitching. 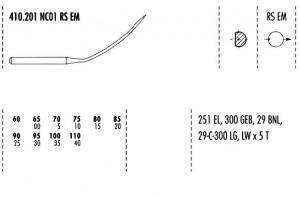 Hemstitch or Wing-Needle (Style 2040) creates a small hole in the fabric as is sews and is used in heirloom sewing. Use natural woven fibers like linen & cotton for best results. 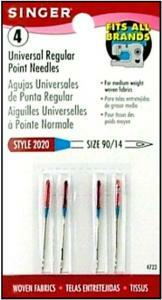 Wedge-Point (Style 2032) needles are for leather and vinyl. 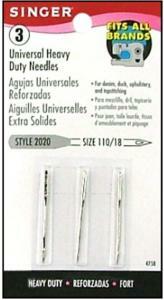 Regular Point (Style 2054-42) serger needles are used for all woven fabrics. 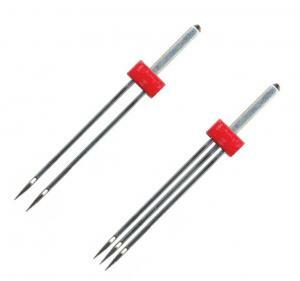 This needle will penetrate the fabric threads of woven fabrics. For use on SINGER® model 14U serger/overlock machines. 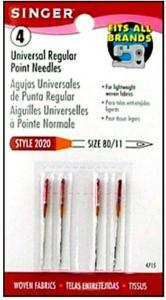 Ball Point (Style 2054-06) serger needles are used for sewing on knits; the rounded tip allows the needle to pass between the fabric threads by dividing them. (Using a regular point needle on knit fabric will result in skipped stitches and fabric damage, causing it to curl.) For use SINGER® model 14U serger/overlock machines. 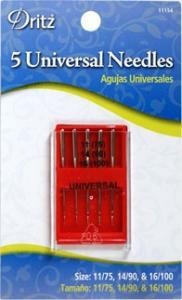 Chromium (Style 2022) serger needles are recommended for SINGER® model QUANTUMLOCK® 14T and ULTRALOCK® 14SH serger/overlock machines. Change the needle after sewing two to three garments or after hitting a pin. Fabric damage is often caused by a bent, blunt or burred needle. 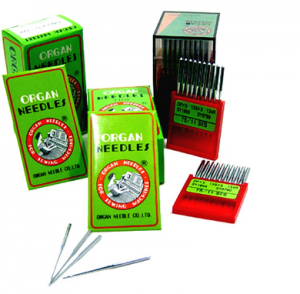 Uneven or skipped stitches are often the result of using the incorrect needle size or type.